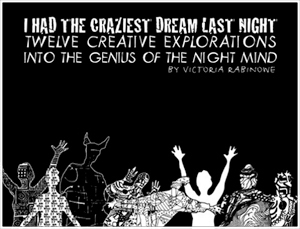 Twelve creative explorations into the genius of the night mind. This is by far the most creative book on dreams out there. that felt like a dream and nudged you to the deepest part of your being? this book will appeal to all those who seek to know more about their dreams. Open any page and let the adventure begin. Playful, artful, delightful, insightful… with black and white images that leap off the pages and goad us into wakeful explorations of the hidden landscapes of the dreaming mind. The author’s genius in merging artwork with terse but right-to-the point directions and questions is astounding and enormously productive in the hide-and-seek game of mining for dream meaning. A creative feast for the eyes and rich food for the mind, this book is a treat and a treasure! 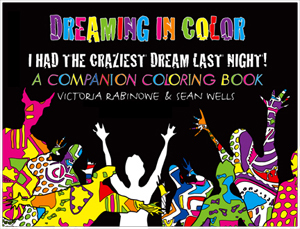 Victoria’s latest work, “I Had the Craziest Dream Last Night” is not only a true artistic pleasure but a serious guide to working with and understanding your dreams. As a reader, you are drawn immediately by the art and design from page to page suddenly realizing that you are in the midst of an important experience in the understanding of your dreams and yourself. As a dreamworker you quickly recognize the no-nonsense, solid but fun multi-disciplinary dream approaches that the book is leading your through. This is not just a book but a piece of educational art, a centerpiece for discussion, something that belongs on the coffee table not just the bookshelf. and host of Dream Time Radio on VoiceAmerica. to helping dreamers feel liberated and empowered in exploring their dreaming imagery. and the nocturnal landscapes to which we all journey, each night. of the rich cornucopia of material discovered by the dreamer. Robert L. Van de Castle Ph. D.
On every page I’m thinking “try that!”. really brilliant instant communication via the dynamic word-and-image format that’s perfect for dreams! I know this book is going to reach a lot of people and have a big impact on them. No excuses accepted — we CAN work with our dreams! Your drawings are so energetic, your language so accessible, your ideas so doable and your point of view so meticulously helpful, it’s a huge achievement. Treat someone to a dream experience. 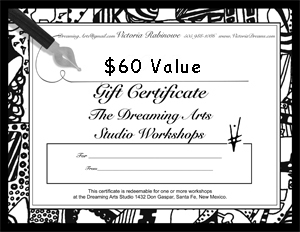 Gift certificate can be applied to books, DVD’s and workshops. 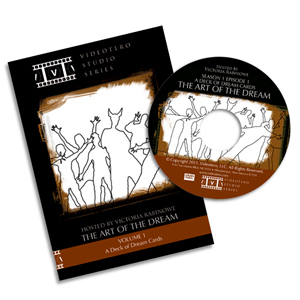 The Art of The Dream Workshop DVD! In this pilot episode, Victoria introduces you to the fundamentals of creative dream work, It includes valuable tips and tricks to enhance your dream retention and takes you through the first creative project: A Deck of Dream Cards.